Of the pursuits for greater accuracy in mechanical watchmaking, constant force can arguably be considered as one of the holy grails of the profession. For as long as watches have been powered by springs, watchmakers have been plagued by the effects of varying driving force delivered from the mainspring to the balance wheel. Early springs tended to be short and varied in thickness and strength. The inconsistencies in their construction led to wide variations in the torque provided by the mainspring to the escapement. And, while the balance wheel can be adjusted by the watchmaker to correct for these errors, it can never be perfectly isochronous. These early springs were capable of powering clocks for no more than a day, often less, and frequently broke. Though, modern mainspring technology has been developed to a point to where they offer enough regularity for most applications. Yet, in the ongoing quest for precision, watchmakers continue to refine their methods for delivering a constant rate of power to the escapement. 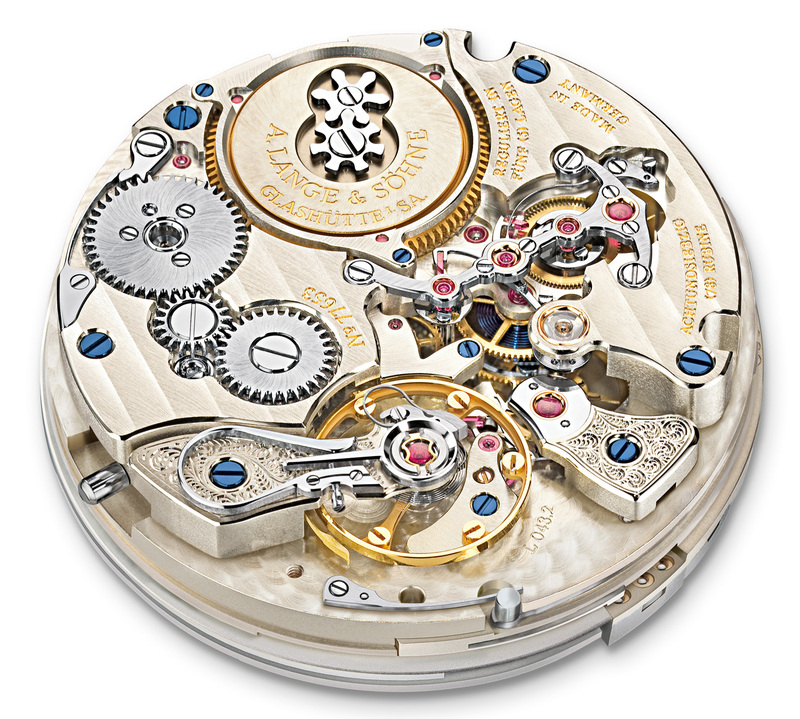 Historically there have been several mechanisms at a watchmaker's disposal to aid in their quest to minimize force or torque variations in their movements. The most common place for these mechanisms to be found is the barrel, and in-turn the mainspring itself. The earliest known mechanism employed to counteract variations in mainspring power was the German 'stackfreed' - literally a strong spring. Developed in the sixteenth and seventeenth centuries, the stackfreed placed pressure on a cam attached to the barrel in an attempt to even out the force delivered by the mainspring. The mechanism acted to oppose the mainspring when fully wound and at its strongest, but would then assist the mainspring when nearly unwound and at its weakest. It worked by exerting an opposing frictional force on the barrel, which meant that the clock required a thicker and more powerful mainspring, and thus also required higher gear ratios in the going train. Counter to its intended purpose, the extra requirements imposed by the stackfreed lead to an even greater variation in driving force. It was a crude mechanism, but not one without its merits. While the Germans were developing the stackfreed, the rest of Europe adopted the chain and fusee - a beautiful an efficient mechanism sometimes attributed to Leonardo Da Vinci. The chain an fusee utilizes the same principle as the stackfreed, however the differences in design make the fusee mechanism much more reliable. The fusee is a cone-shaped pulley with a helical groove that when wound with a chain attached to the barrel equalizes the uneven pull of the mainspring as it runs down. When the mainspring is fully wound, the chain wraps around the circumference of the fusee from bottom to top, with the top end of the chain riding off the narrow top of the fusee. This in-turn means that when the mainspring is at its strongest, the torque applied to the fusee is reduced due to the fusee's radius. As the mainspring is wound down, the chain is wrapped around the barrel and is unwrapped around successively wider portions of the fusee's body. The larger polar moment of inertia provided by the larger radius of the fusee compensates for the weaker force of the spring as it winds down; keeping the drive torque constant throughout the power reserve of the clock. One notable modern interpretation of the chain and fusee is Romain Gauthier's Logical One. Instead of a more traditional chain and helical groove system, the Logical One uses a short ruby-link chain pulled by an innovative snail cam to provide the timepiece with nearly two days of constant chronometric power. Another frequently used method for eliminating force variations in both modern and historical timepieces, and often used alongside the fusee is the stopwork. It's a simple mechanism that limits the amount of wind and unwind that the mainspring can go through, effectively limiting to its chronometric power reserve and evening out the torque by eliminating both extremes for power delivery from the barrel. Today, watchmakers have developed mainsprings with reverse coils that do a lot to even out the force delivery without the need for additional regulatory mechanisms, and while all the mechanisms that we've covered are used to ensure some degree of constant force, they are not generally referred to as constant force mechanisms. When watchmakers refer to constant force mechanisms, more often than not, they are referring to a remontoire (remontoir d'egalité in French). This is a device usually placed farther down in the gear train, either just before the escapement, or as part of it; usually taking the form of a spiral spring attached to a train wheel. While I briefly touched on remontoires in my last post on watchmaking, now it's time to dive in. The purpose of the train remontoire is to reduce variations in the driving force that acts upon the escapement, thus increasing the isochronism of the balance wheel. The remontoire's spring is periodically wound up by the mainspring as it delivers force to the escapement, and as long as there is enough energy from the mainspring to wind it, the remontoire spring will provide an almost unvarying amount of energy to the escapement. Ferdinand Berthoud noted in his work "Histoire de la Mesure du Temps" that the earliest known remontoires were fitted to German astronomical clocks around the year 1600, and although no-one knows the identity of the inventor of the remontoire, it is often attributed to the Swiss mathematician and clockmaker Jobst Burgi. His clocks are the earliest examples known to us. 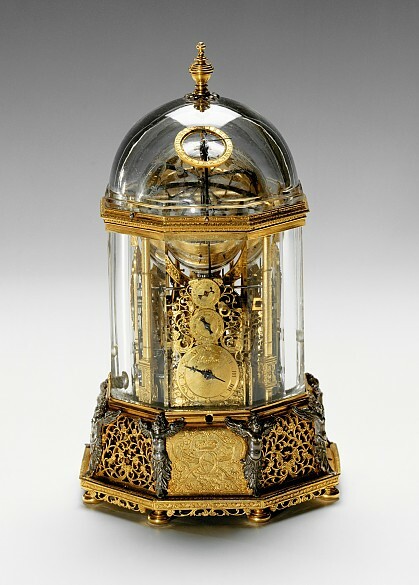 Burgi's first three experimental clocks made between 1595 and 1605 all employed a remontoire mechanism. His first clock ran for three months and rewound its going train once per day. The second rewound once every twelve hours with the third reducing that interval to once per hour. Finally, in 1615, Burgi completed his masterpiece, a quarter-striking astronomical clock that rewound once every 15 minutes. Though, throughout the seventeenth and eighteenth centuries mainspring quality improved immensely and it became much easier to calculate the correct fusee profile to match the mainspring, diminishing the demand for remontoires. 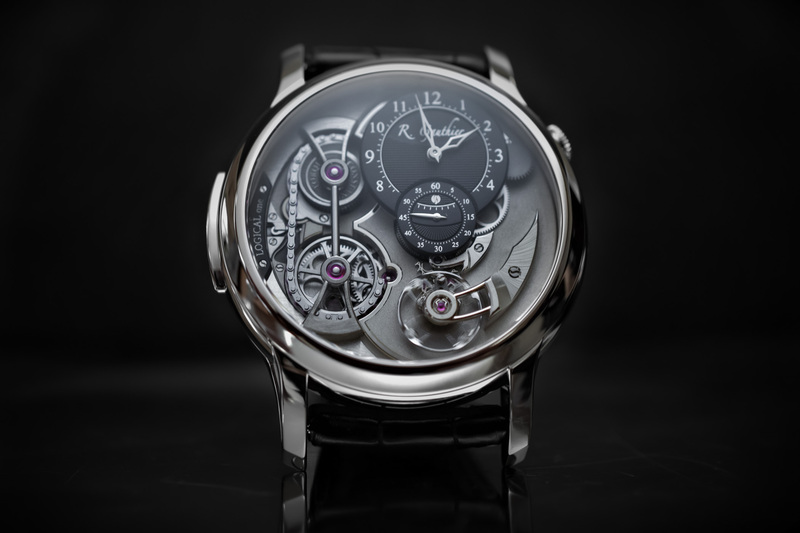 Nevertheless, the remontoire was not relegated to the ash heap of history. They were still employed historically, as well as today, in cases where the highest accuracy was required. Thomas Mudge, the inventor of the detached lever escapement, used a remontoire in his watch for the King of Spain and perfected a remontoire which rewound before each impulse for use in his marine chronometers. 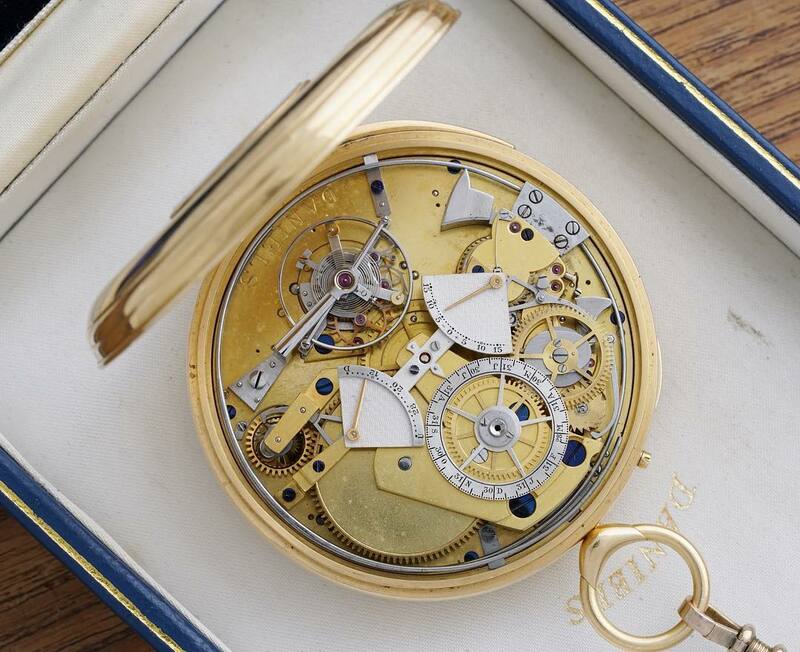 Although, it can be argued that the most perfect train remontoires ever constructed were those created by John Harrison for his second timepiece H2 and all of his subsequent clocks with his work with culminating in the use of a 7 and 1/2 second train remontoire used in his masterpiece H4. 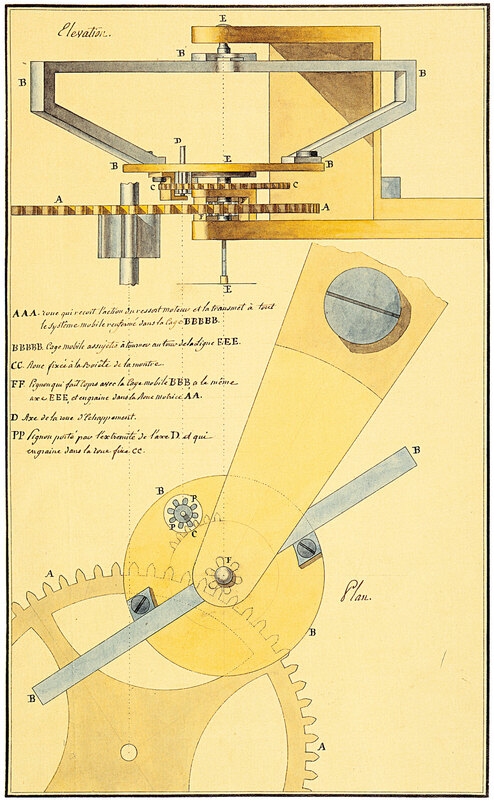 Abraham-Louis Breguet's original drawing in the patent application for the tourbillon. Shifting away from the remontoire, it's necessary that we also discuss the tourbillon and its relationship to constant force devices. The tourbillon was invented by Abraham-Louis Breguet and patented in 1801. In essence, Breguet realized that positional errors in the vertical plane in which pocket watches spent a majority of their time could be eliminated by constantly revolving the entire escapement. He achieved this by mounting the escapement in a light steel cage driven by the train of the watch. The escape wheel pinion extends below the cage and is driven as the carriage revolves by a fixed fourth gear in the going train. And while there is enough history of the tourbillon to merit an entire post of its own, we need to move on to how it fits into the context of the constant force escapement. One of the basic operating principles of mechanical watches is that every single wheel and pinion, even the barrel and mainspring, have to start from rest every time the escape wheel is unlocked. In tourbillon watches, this problem is greatly increased by the fact that the carriage itself adds a non-insignificant amount of additional mass exactly where it's not wanted at the fast end of the going train. The remontoire and its 'extreme case' the constant force escapement addresses this problem because in addition to providing a more uniform driving force to the balance wheel, they isolate the escapement from the rest of the going train. 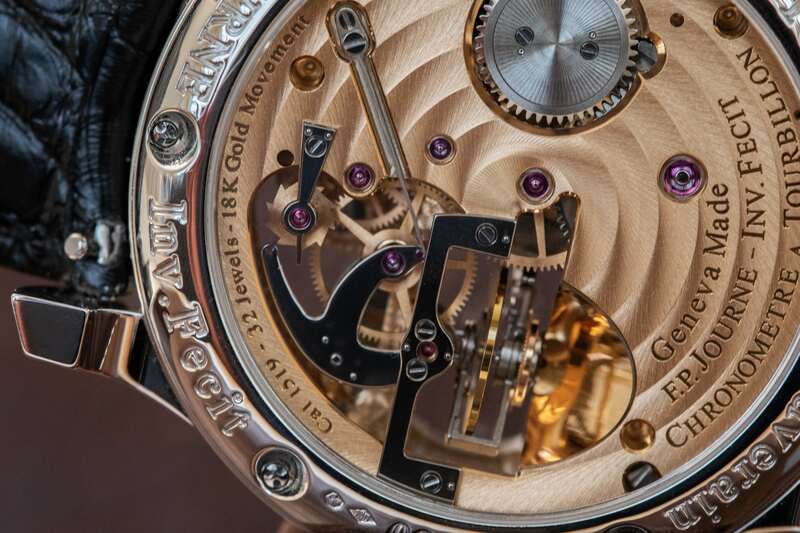 Thus, when using a tourbillon, it is even more advantageous to incorporate a remontoire into the mechanism. The George Daniels Grand Complication Pocket Watch featuring a tourbillon. Let me be clear, integrating a remontoire into a tourbillon watch is a significant design challenge. Breguet only ever produced two watches with the engraving "Echappement à force-constante", though only one survives and it has had its original escapement removed. It wasn't until 1981 when Derek Pratt set out to design a completely new remontoire tourbillon that this concept would be fully realized. Derek's revolutionary idea was to mount the train-driven remontoire within the tourbillon cage itself. 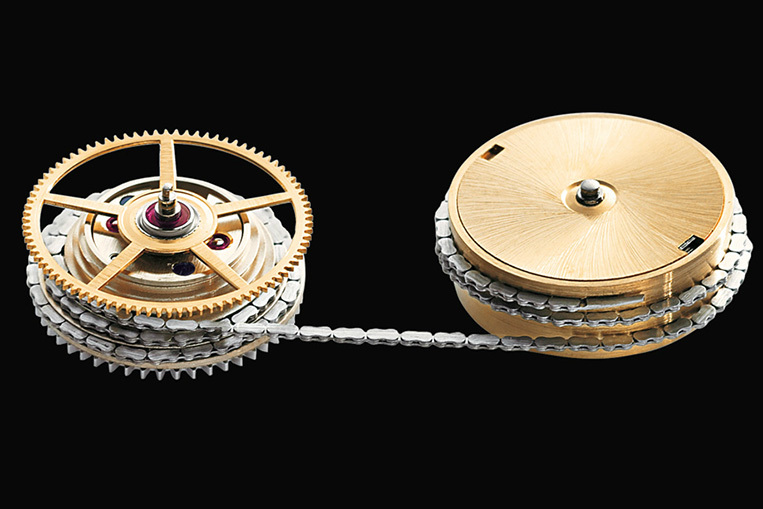 As stated previously when discussing the design of the tourbillon, the escape pinion descends below the underside of the carriage and engages with a fixed fourth wheel. 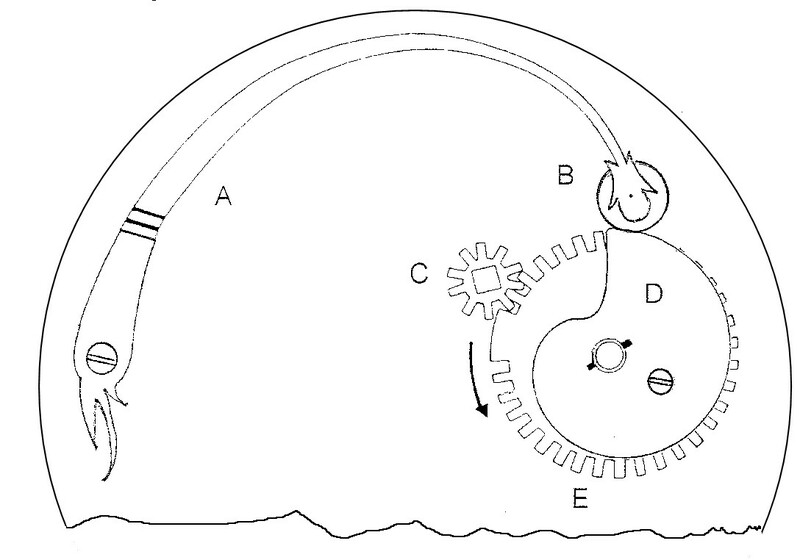 In Derek's movements, instead of connecting the escape pinion to this fourth wheel, the pinion is connected to a three toothed remontoire wheel. The remontoire wheel, as Derek called it, is locked by a pair of pallets that while similar to the pallets of a lever escapement in appearance, had a completely different function. No impulse is delivered to the remontoire wheel when it is unlocked. It simply advances 60° and is then locked again by the other pallet. 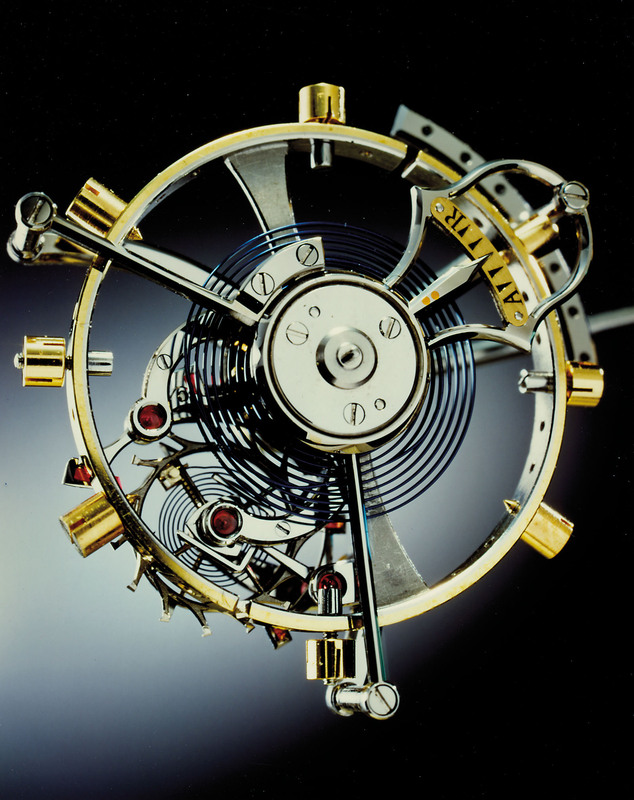 A conventional fifteen tooth lever escape wheel is then mounted freely on the arbor of the remontoire wheel and is connected to it by the remontoire spring. It is this spring that drives the escapement which then delivers the impulse to the balance wheel. There are two major advantages to Derek's design. First, the rewinding of the remontoire spring and the 6° movement of the tourbillon carriage both take place after the impulse and before the locking of the pallets. This leaves the impulse free of any influence from the inertia of the train. Secondly, the use of a triangular cam between the tines of the fork ensures the locking and unlocking of the remontoire wheel, and eliminated the danger of accidental unlocking due to shock. Because of this design and the fact that the remontoire wheel is rewound at every impulse, his remontoire tourbillons can truly be considered to have constant force escapements. 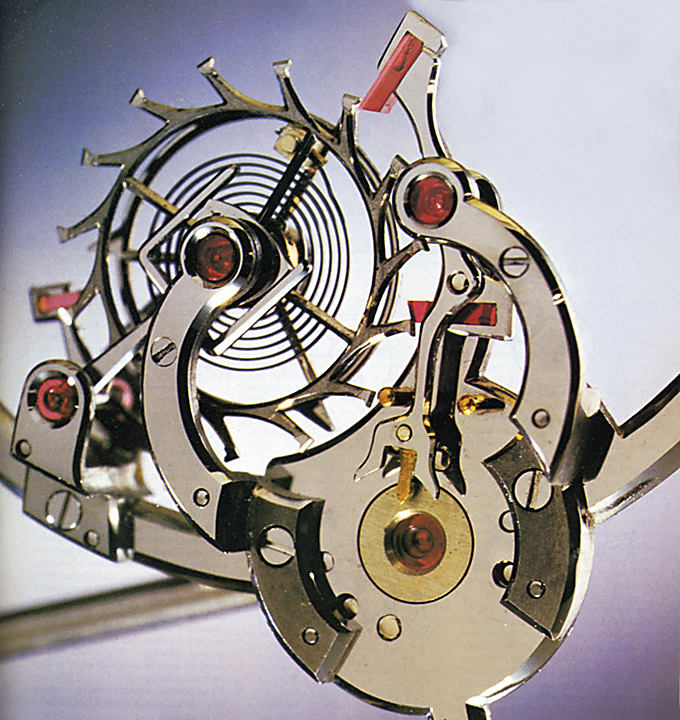 Derek Pratt's constant force escapement has been hugely influential in how I think about the design of these mechanisms, and I see it as the culmination of the more than four century pursuit of precision in mechanical watchmaking. It's truly an inspiration and something I hope to build on in my own future work.